For many companies, Sales Software Begins and Ends with CRM. Customer Relationship Management software has replaced the rolodex by offering features well beyond a database of customer contact information. But there is so much more! Today, sales organizations benefit from automation, opportunity management, campaign tracking, and powerful analytics. 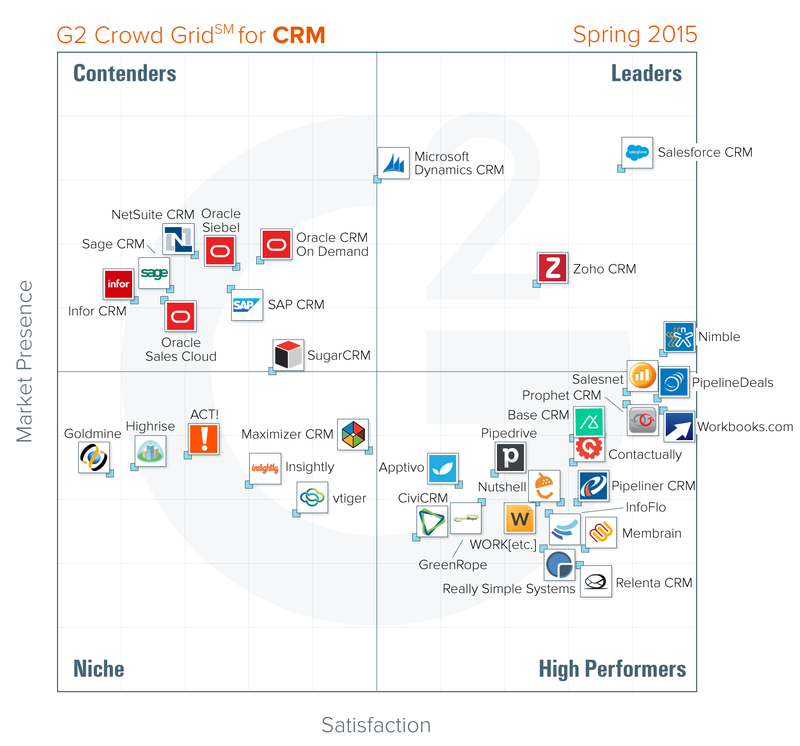 So far in 2015, G2 Crowd released 12 Grid℠ Reports relevant to sales teams. Use G2 Crowd’s free Grid℠ infographic, Compare Builder, and Buying Assistant to evaluate sales tools for your business. Web conferencing software enables sales teams to host online meetings and seminars with audio, video and screen sharing. Social media monitoring refers to software designed for sales organizations to listen to social media platforms. Performance management software enables sales managers to align an organization’s goals, set company performance standards, and measure employee progress in pursuit of these goals. For high-volume inbound sales teams, call tracking software is used to attribute inbound phone calls to their sources. Proposal software is designed to streamline and automate the proposal process for sales operations. Email tracking software offers advanced reporting and analytics to track email opens, link clicks, and downloads for messages sent by sales. Presentation software enables sales teams to communicate information in an organized, digestible way way. Sales intelligence software provides sales professionals with background and contact information for a prospect, company, or industry. Sales compensation software automates the accounting and administration of commissions and incentive plans. Sales gamification software enhances the sales process by adding competition and recognition as additional motivation for sales representatives. E-Signature software helps speed up the sales closing process by gathering signatures without printing a document and physically signing. Customer Relationship Management (CRM) systems enable companies to track and manage all customer interactions across the customer lifecycle from lead to order to support in one master system of record. Whether you’re a sales user on a large or small team, G2 Crowd invites you to add your voice to the research. Help other sales professionals by writing a review of the sales software you use to sell.